Adobe Premiere Pro and Adobe After Effects share the simplest and most powerful round-tripping functionality between any two applications I’ve seen. This functionality has been present since version CS3, as far as I know. In this series we’ll look at the two ways in which you can move projects between Premiere Pro and After Effects. Sometimes, you only want to key a few shots, or add motion graphics to a few frames, etc. 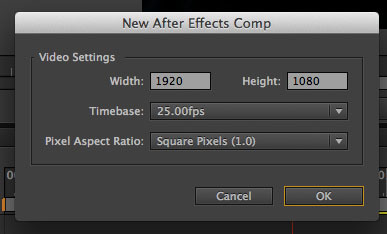 If this is all you want from After Effects, it is pointless to bring the entire project over. To accomplish this workflow with Premiere Pro and After Effects, all you need is Direct Link, which we’ll cover next. The disadvantage of this workflow is that you don’t get to use After Effects’ powerful finishing tools. If you are using After Effects for VFX, titles, color correction and mastering, then you will need to port your entire Premiere Pro project over. You can use the same Dynamic Link method, or just import your project into After Effects. We’ll look at both these methods one by one. One disadvantage of this method is if you want to use Speedgrade to finish your project. You can no longer use the same Premiere Pro project without rendering your timeline in After Effects first. After this, you must use Direct Link to go back to Premiere Pro and then use the Adobe Premiere Pro to Speedgrade Direct Link workflow. The round-about way of exporting shots for VFX is first rendering the edited clips from your NLE, then importing them into your VFX application, completing the job, and exporting your finished work. When you’re done, import the new shot and replace the original one. With Dynamic Link, you can send a shot directly to After Effects with one command, work on it, save it, and the shot in your Premiere Pro project will change automatically. It’s just as easy as working in Autodesk Smoke, and you don’t feel you’re in two applications. Replace shot/clip with After Effects Composition – when you want to work on single clips. New After Effects Composition… – when you want to make a new composition in After Effects without linking it to any particular clip or shot. Import After Effects Composition… – when you’re editing and want to import a totally new composition (not always made with original clips, like motion graphics work, chroma-keyed foregrounds only, etc.) from After Effects. Make sure After Effects is open. Select all of the above in Premiere Pro and choose File > Adobe Dynamic Link > Replace with After Effects Composition (or right click and choose Replace with After Effects Composition). A new composition will open in After Effects, with the settings from the current sequence. The clips will be in the same order, and you can key your clips here. Once you’re satisfied with your key, save it. If you go back to Premiere Pro, you’ll find that your clips will have flattened to a single clip, which is actually an After Effects Composition file (*.aep). You can verify this by checking it in the Project bin. Once your composition is done, and you return to Premiere Pro to continue editing, you might want to make changes to this composition again. To do this, you shouldn’t repeat the same steps, because that will create a new link. Once a Dynamic Link is created between clips and After Effects, don’t change it. To modify your composition, all you need to do is select the composition in the Premiere Pro timeline, right click and choose Edit Original. This will preserve the Dynamic Link and open the composition in After Effects. Make the changes, and hit save. That’s all there is. You can change the name of a composition in After Effects, but that will not reflect in Premiere Pro. However, the Dynamic Link will still persist. You must be careful with the names of the compositions, and try to ensure there aren’t any overlapping names, etc. Dynamic Link creates its own filenames based on the Premiere Pro project filename, so knowing this allows you to plan your composition names accordingly. Once you’re done with your compositions you can close After Effects and continue working with its compositions in Premiere Pro. This will free up some valuable system resources. Now, instead of being slave to the Premiere Pro sequence, you can create a composition exactly matching your finished shot requirement. The length of this composition is 30 seconds by default. The big problem with this method is that your clips are not imported into After Effects. You’ll have to manually import them and layer them to your liking. This isn’t a shortcoming, mind you, because there is no way After Effects can know what you have in mind with the clips you want to import. Now, because this isn’t really a dynamic link you can’t save it and expect it to show up in Premiere Pro. The composition is created in Premiere Pro, but it resides in your Project bin. Once you save the composition in After Effects, return to Premiere Pro, find the newly created composition and drag it to your timeline. The third way to bring an After Effects composition into Premiere Pro and dynamically link it is by importing it manually. Go to File > Adobe Dynamic Link > Import After Effects Composition… and select the saved composition. Once it has been imported, the composition will be linked dynamically and will work as above. Replace with After Effects Composition – when you want to composite a few clips at a time, and the desired end product matches your Premiere Pro timeline settings. New After Effects Composition – same as above, except this time the desired end product doesn’t match your Premiere Pro timeline settings. Created composition automatically comes into Premiere, but you’ll need to drop it into the sequence manually. Import After Effects Composition – when the above methods don’t work, or if you’re creating compositions from clips that are not part of your editing process (it came from a third-party, for example), create a composition and manually import it into Premiere Pro. The common factor among all of these methods is that you’re importing a *.aep composition into Premiere Pro, with an established Dynamic Link. Make changes in one app, and it shows up in the other. In Part Two we’ll look at importing Premiere Pro projects into After Effects, and working the other way around as well.